Summary: Destined to be a classic, this “powerfully moving” (Chad Harbach, The Art of Fielding), multigenerational debut novel of an Irish-American family is nothing short of a “masterwork” (Joshua Ferris, Then We Came to the End). I realize that I missed the boat with an end of the year "Best of 2014" list, but there is one particular book that really stood out to me. It's hard for me to definitely say that one book was my very favorite of the year, but if I were forced to choose, I'm pretty sure I'd say that book is WE ARE NOT OURSELVES by Matthew Thomas. This book was incredible! And because this book was so amazing on so many levels, I've been procrastinating writing a review. I just don't think I can do justice to this book. It was beautifully written and I couldn't stop reading it... although I didn't want it to end either; and I was both touched and challenged as a reader. This book encompassed everything I want an epic novel to be; and quite frankly, it blew me away! WE ARE NOT OURSELVES tells the story of Eileen and Ed Leary. Eileen was raised by Irish immigrant parents, and their house was full of both heartache and laughter. She married Ed, a scientist who was both kind and practical. Eileen hopes that Ed can increase her social status; however, Ed doesn't have the same drive to live in that world. Through the years, Eileen pushes Ed to aspire to more, but he's content with his house, family, and job. One day, Ed becomes more reluctant and it's apparent to Eileen that something is terribly wrong. Eileen and their son try to keep the family together and protect Ed, but even the best intentions ares futile in this situation. I am well aware that my brief description doesn't even begin to detail the events of this novel, but I knew nothing going into this story; and I believe it's best not to know too much about the Leary family. Suffice it to say, that WE ARE NOT OURSELVES delves into many of the same situations that family's face each and every day as well as a few that we can only hope never happen. This 600+ page book takes readers through the ups and downs of Eileen and Ed's relationship and gave me some powerful things to think about including living, dying, love, and grief. On a larger scale, WE ARE NOT OURSELVES explores middle class family values in the 20th century, and I am pretty sure it will resonate with every reader who wisely picks up this book. I could relate to the immigrant experience that my grandparents had, as well as the aspirations of Eileen. Unfortunately, I could also relate to what eventually happens to Ed. I would love to go into specifics about how much this novel affected me and broke my heart, but I'm afraid I'd spoil it for others. I cried over and over again as I read this book and it was apparent to me that Mr. Thomas is either one incredibly gifted writer or someone who has experienced similar pain. (I'm pretty certain it's both!) The pain and rawness of this novel is so real and so well done that I actually can say with confidence that I consider this novel a masterpiece, and that it will have a special place on my bookshelf. In fact, I know I will read this book again someday... and I don't say that very often! 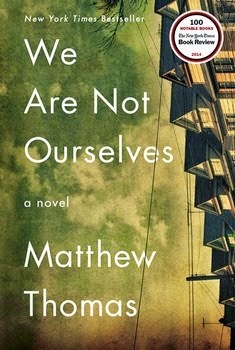 It's is incredible to me that WE ARE NOT OURSELVES is Matthew Thomas' first novel. It is epic and he accomplished so much in it. I really think it might become a classic. No pressure, but I have no idea how he's going to top it! He truly has a way with words and I can't say enough about beautiful of a storyteller he is. This isn't going to be a surprise, but WE ARE NOT OURSELVES should be a must-read for every book club. I actually think it is a must-read for everyone but that might be going a little too far. There is a reading guide available with fifteen discussion questions and some ideas for ways to enhance your meeting. Some of the themes you might want to explore include family, loss, marriage, parenting, control, the role of women, appearances, fear, coping, and love. I realize I've gushed about WE ARE NOT OURSELVES, but this novel is truly "gush-worthy." Highly recommended! I'm glad I spotted this review when I did! I remembered seeing it on the Amazon Vine list and after reading your review, I went over and nabbed the last one! I've seen this book on several end of the year lists and have to be honest here - I've avoided it because it's so big. I need to get over that and give it a go. I wonder if this is available on audio. Sounds like a must read. I just went and looked and it is available on audio. 20+ hours worth, but sounds like one to put on my wishlist there. Thank you for your review, this sounds like a book both my mother and I would enjoy! I liked this one a lot - it made my Best Debuts of 2014 list. Didn't make my overall Best of 2014 list b/c I thought it had a slow start and I didn't really get into it until they got past the part about Eileen's childhood and moved onto her relationship with Ed. Once that happened, I was all in! Thanks for the review Julie...I'm currently listening to this one on my iPod, which I left at work...darn it! Hopefully I will get back to it tomorrow. I've seen this one around but wasn't really sure what it is about. Thanks for the review! I've seen so much good about this book over the past months and I did load it on my iPod, just haven't embarked on that journey yet (it is a long audio!). I'm so happy to hear another good review! I'm going to make sure I get to it soon. I adored this book and would have put this on my best of 2014 list had I made one. Matthew Thomas got it so right. My husband is going through something similar with his father, and as much as I love this story, I won't let him read the book. It hits a little too close to home, which means it is that good.